I’ve read that when someone returns to their home, where their parents still live, they tend to act more like their teenage self and revert back to that type of behaviour. That definitely plays a part in how Hugh can act at home. He will argue with this parents, be stubborn and annoying, and torment his sister. He directs some of that sisterly torment at me too, and it’s seriously like dealing with a 16 year old sometimes. That’s not to say he is always like this, because usually he is a mature, level-headed, compassionate man, but he has his teenage times.. luckily we aren’t living here long term and will be moving to Seoul. Hugh had already seen my sulky and moody teenage times at home in Australia so he was fully aware of that before he married me. But because we moved to Korea after 2 years of marriage, this was more of a surprise for me. In international relationships you always have that change in a partner when moving to another country. 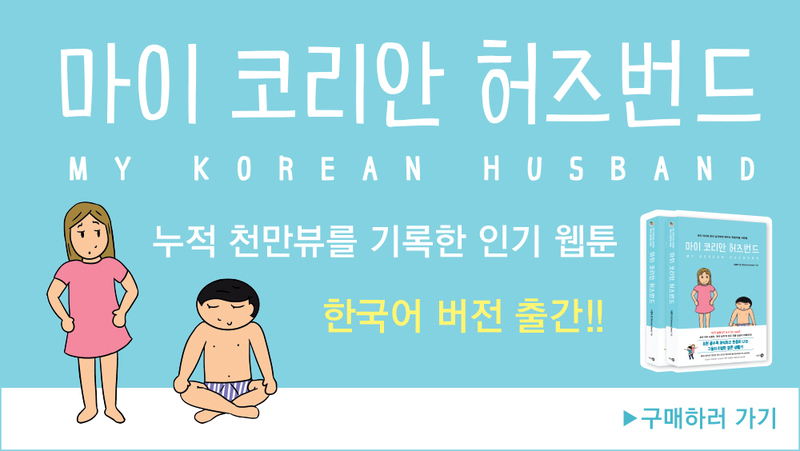 Many women married to Korean men find that after moving to Korea long term, that their carefree husband has turned into a stressed workaholic because of Korean work culture. There needs to be understanding on both sides. That’s why marriage is about deciding every day to love someone, even when they can be at their most annoying. And I bet Hugh gets his revenge on me in a ‘My Australian Wife’ comic! Quick little video that we filmed today. Is the mango sandwich better than the strawberry sandwich? What weird sandwiches have you tried? It was SO nice to catch up with Simon and Martina in Seoul. Although Simon isn’t in this video we did see them too (and Spudgy and Meemers). We definitely need to visit them in Japan. The places we ate at were ‘Spicy Bite’ and ‘On Ne Sait Jamais’, both in Itaewon. Please subscribe to the Nicholalala channel. Help support the Nicholalala webtoon (and so I can continue to get paid ^^) by liking, commenting, and sharing. Also check out the other webtoons on LINE Webtoon! We ask questions to Australian/Korean married couples! How did you meet? What aspects of your partner’s culture have you adopted? Best and worst things about international/intercultural relationships? Advice or other couples? Big thank you to everyone who helped us make this video! Check out Rachel and Nick’s YouTube channel, The Drunken Bear here. Check out Sophie’s blog on raising a bilingual child here. There is a reason why we don’t do these videos regularly: they sure are a pain to edit! But we had been wanting to do something like this for a long time. This video is just Australian/Korean couples, but we may in the future do another video with a bigger mix of people. We wanted to focus on the culture rather than race aspects, as too often people focus on race and what people look like. But culture is what we should be talking about. How do you navigate and international and intercultural marriage? It’s an ongoing exploration and discussion. (A video with Korean subs will be coming). Hugh and his sister watched this drama, so I saw bits and pieces of it but didn’t watch all of it. I was glad to see that a popular drama has a lead male that wasn’t another rich son of a CEO, like almost all other dramas. Apparently it has sparked an interest in men in the special forces though. What I find a bit ironic is that now there is this interest in how soldiers speak and even some women (who don’t have to do compulsory military service) have started trying to talk like a soldier. Previously, men who finished their service could be self conscious about their automatic soldier speech, especially because people might make fun of it. But now it was in a drama, it’s suddenly “cool”. How fickle people are…haha.